It is our distinct pleasure to welcome you to LAKE BLACKSHEAR MASON HUGHES REALTY, INC. website. We sincerely appreciate your visiting and your browsing, and we hope you will find the most informative information concerning our beautiful area and services that we have to offer. 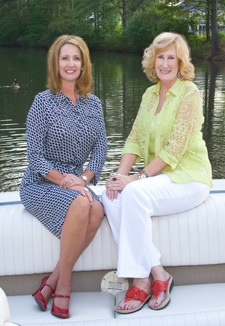 Michelle Mason Hughes and Cheryl Mason, having lived on Lake Blackshear for 30 years, and having had the honor of serving our friends and our neighbors real estate needs for 22 years, have earned the reputation of being award winning professionals, and being “Names that you know and Trust”. We are looking forward to continuing our real estate services for our past, present, and future customers and clients with cutting edge technology and marketing. Our primary mission is to serve each of you with professionalism, respect, honesty, and compassion as we are passionate and cherish each of our relationships. Please allow us to service your needs whether it is a Comparative Market Analysis of recent sales to determine your Present Property Value, Management of your Property whether On a Vacation Rental or Long Term Lease or Rental Status, Listing or Marketing your Home or Property, or assisting your Relocation Needs to other types of housing. It would be our pleasure to assist you in reaching your real estate goals.